If you’ve just bought a brand new house, congratulations are in order that’s for certain. Often fencing for new houses gets overlooked as the pressing jobs around your new build take over. Jobs such as fitting blinds, curtains, shelves and bedroom furniture often takes priority over the humble perimeter fence. Fencing for new houses may often be the first thing to get overlooked or scrimped on, however fitting fences right at the start is easier than retro fitting fences years down the line. Some new build houses often have some fencing installed, for others it’s an optional extra. In many cases fences are left out with only marker posts to show boundaries of properties. Any fences that are installed can be of poor quality, plus neighbours may steel a march on you and install their own fences, which leaves your property with potentially mismatched fence panels. Fencing for new houses – get it right at the start. The solution is simple and a perfect way to introduce yourself to your new neighbours. Why not give them a knock and speak to them about sharing the cost of boundary fences. Almost all people want great fences so it’s a shared need you both have. If your house has 3 shared boundaries then the cost can be split 3 ways. One of the biggest benefit of getting fences installed as a group is of course potential savings you can make. Long term the very best aspects of getting great quality fences installed at the start is you can sit back and relax year on year knowing your fences are strong, well made and going to stand the test of time. 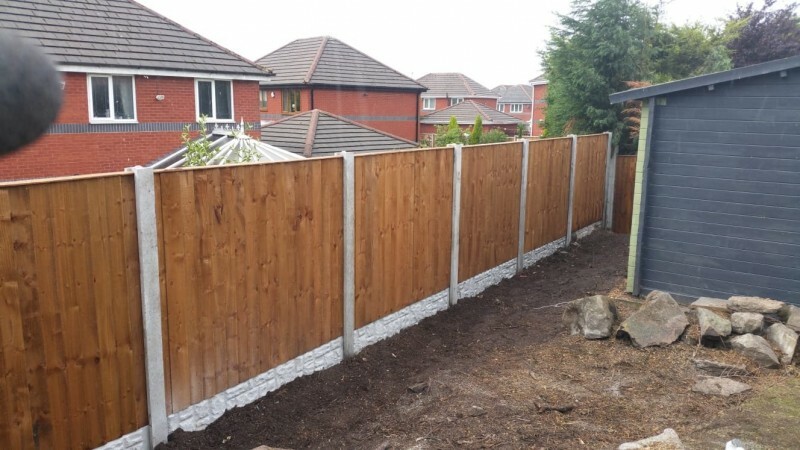 At Advanced Fencing and Gates we are constantly called out 12 and 24 months after people move into a new build to replace cheap and poorly installed fence panels. Many have blown down, others simply given way as they we’re nt up to the job in the first place. Home owners left with mismatched fences and damaged young plants in the garden. So why not get together with neighbours and get fences right from the start. Then sit back relax or maybe get on with putting the curtains and bedrooms together in the calm knowledge all perimeter of your home is safe and sound for many years with Advanced Fencing and Gates panels standing strong. Get your fences right from the start and get in touch with Advanced Fencing and Gates today. We serve the whole of the North West with great service, superb installation and great quality handmade fence panels.